Boundary Farm Glamping07888 696454work GlampingWant to try " Glamping"? Come and stay in our luxurious safari tent and enjoy a fantastic and authentic stay in the glorious Suffolk countryside. Unwind and immerse yourself in a simpler way of living, with added home comforts, but without life's daily the distractions. Boundary Farm is a ideal place for family and friends to have a holiday or for a romantic getaway. Enjoy your very own private two acre meadow. Hear the sounds of the dawn chorus undisturbed by traffic and enjoy the majestic sunset views from your own luxury safari tent. Children can roam our meadow, and play the old fashioned way. Want to try " Glamping"? 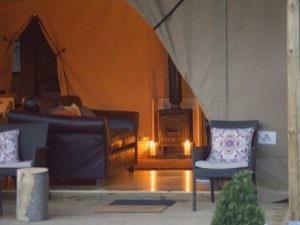 Come and stay in our luxurious safari tent and enjoy a fantastic and authentic stay in the glorious Suffolk countryside.